By bus it takes 8 hours to travel 366 km from Bangkok in Thailand to Battambang in Cambodia via the border crossing Poipet. If you want to travel direct then you need to take one of the tour company services departing from the Khao San Road area. The other option is to take one of the cheaper bus services as far as the border crossing near Aranyaprathet and then take a minivan service from Poipet on the other side of the border to Battambang. There are 2 direct bus services a day from Bangkok to Battambang which you can book online. The first part of the journey from Bangkok to Sisophon in Cambodia is by bus. The second part of the journey from Sisophon to Battambang is by minivan. Use the Search Box below to book your tickets from Bangkok to Battambang. Travel Mart bus services to Battambang depart from 51 ซอย โรงไหม Chao Fa Rd, Chana Songkhram, Phra Nakhon, Bangkok 10200. Travel Mart bus services from Bangkok terminate at the intersection of Street 106 and La He Street in Battambang. Battambang is Cambodia’s second largest city with a city centre population of around 195,000. 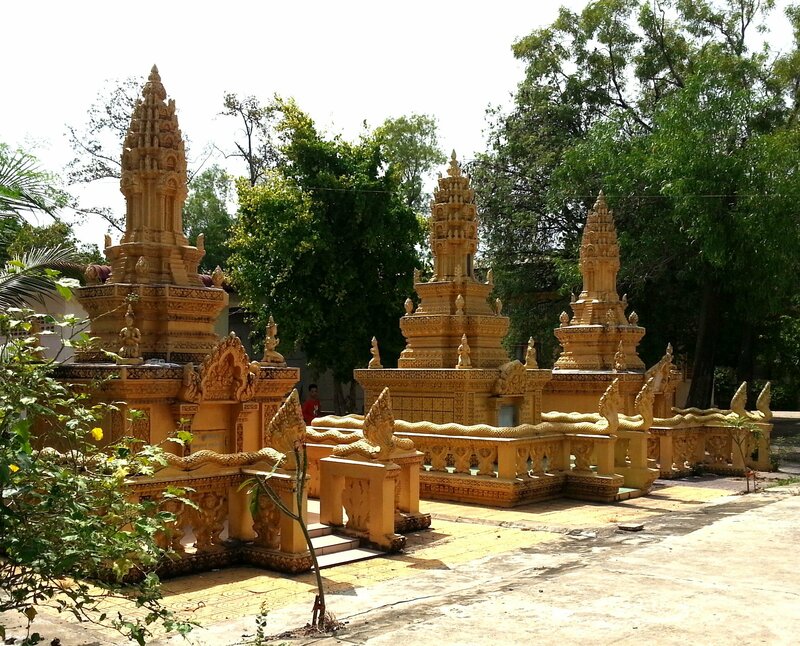 Battambang has a long history dating back to the 11th Century with a Khmer settlement. The ancient Khmer civilisation was responsible for the construction of massive temple complexes in both Thailand and Cambodia the most famous of which are Angkor Wat and Angkor Thom near the modern day town of Siem Reap. The Khmer people also built temples in and around Battambang, the best preserved of which are Wat Banan, 21 km south of Battambang City, and Wat Ek Phnom, 9 km north of Battambang City. In the early 20th Century Battambang came under the control of French colonialists. The French modernised the city establishing a grid pattern for the city’s streets and constructed European style buildings in the city, the most famous of which is the Governors Residence. More recently the area around Battambang was the location for some of the worst atrocities committed by the Khmer Rouge under the direction of Pol Pot. The Khmer Rouge executed large numbers of their fellow Cambodians in the caves under the temple of Phnom Sampeau. A memorial has been set up there and visitors can see displays of skulls and bones of the victims behind a glass screen. By way of contrast, the City of Battambang is a lively place with a good range of facilities for foreign visitors. Battambang has a thriving bar and restaurant scene, and a range of cheap to moderately expensive places to stay. The famous Battambang Bamboo Railway service, which ceased operating because the railway lines have been brought back into service for real trains, has now been reopened using a different stretch of track.